April 17, 2018, 11:08 AM · The discussion of old violins verses new violins, for enthusiasts, will continue to be intriguing, thought provoking, argument invoking, and passionate. Most experienced violinists are confident in their concepts of how a new or old violin sounds. Can any violinist state that a violin of a particular era will surely bear some specific characteristics? Did he/she play several examples from the same era, representing different makers, countries, different schools/styles, and a variety of woods, and still find a truly memorable similarity between them in order to say old violins sound old? If so, have they played enough good violins by more contemporary makers and been able to confirm an utter absence of that memorable “old violin characteristic” in every single one? How do modern violins sound? Can one describe what a new violin sounds like so that we can confirm that no old violins sound as such? Throughout history, there have been countless schools, luthiers, and teachers, and a large range of different types of sound being attempted and achieved as the needs and preferences of violinists changed and evolved. One very easy way to lose a rigid idea of “old violin sound” is to play on a ton of them. Is It Really About Age? A common complement for a fine new violin is “It has that ‘old violin’ sound”. To be fair, a violinist may certainly find a quality in a new instrument to be reminiscent of an old violin previously experienced. However, if the new violin has that quality as well, why not instead confirm that we can no longer attribute that quality to the violin’s age? To flip the argument, what do old violin enthusiasts find lacking in new instruments? I have heard them described as less mature, less responsive, raw, brash, tinny, or harsh. Yet, I have never seen a violinist pick up an antique violin, find these characteristics, and comment that it sounds new. However, that comment would make no less sense than saying that a new violin sounds old. I have seen many old violins, by famous makers no less, sound plenty harsh, tinny, and immature. I’ve also seen new violins sound warm, smooth, and lacking brightness to a fault. When we describe a violin as sounding old, do we assume that being old is the reason for that sound? Do we believe that the aged wood is responsible for a particular characteristic, and that the violin in question must have sounded completely different when it was first made? Perhaps when we say “old violin sound” we are not at all implying that the violin’s age is a factor, but rather that the workmanship and wood of a violin’s era typically yielded the quality we are hearing and most probably had such tonal qualities at birth. 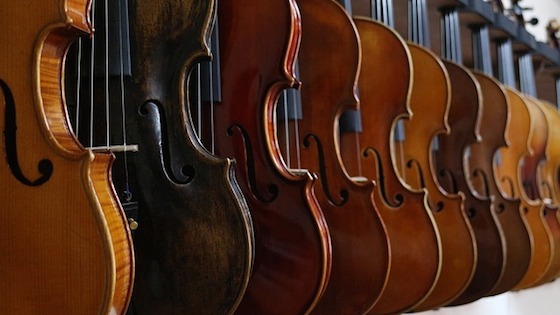 Science might be able to explain the changes in wood’s properties and the evolution in a violin’s dimensions, arching, or anything else to do with the aging process. As for what we hear now in comparison to what was heard hundreds of years ago, we don’t know! Old violins were made by Italian, German, French, Czech, Hungarian, American, and makers from many other countries. Many of us have relatively narrow experience with them given the broad range of styles, the continuous experimentation, and regions of different woods. Violins made within a narrow time span of the Seventeenth Century alone cover a wide spectrum of violin sound. In the early 1600s Jacob Stainer inspired a model, characterized by high arching and a narrow figure which typically yielded a warm, mellow, deep, and sweet tone. In contrast, the wider and less arched range of models developed by Antonio Stradivarius, which aided in a brighter tone and more projection in a large space, became more important with time, but not to the exclusion of the Stainer model. The popularity of the Stainer model’s warmer, more intimate tone remained influential in Vienna, Austria, and parts of Italy. Violin enthusiasts of today may have encountered successful products of Stainer’s influence in violins from the Klotz family of Mittenwald, Germany, and frequently seen violins by the Thir family and school of Austria. Meanwhile, violin making in Cremona and Turin as well as in Mirecourt, France reflects the influence of Stradivarius and Guarnieri, valuing a typically more powerful, projecting tone. Some examples of the great French violins are Nicolas Lupot, Jean-Baptiste Vuillaume, Charles F. Gand, and Léon Bernardel, son of Ernest. Most of us have conceptions of violin sound which are based on playing a little of this and that violin for a couple minutes here and there. How much of this variety do we get to own long term and discover both the weaknesses and possibilities? We don’t get to perform a concerto, chamber music, play a romantic era sonata with a thick piano texture, teach in a small room, or repeat a concert program in contrasting concert halls. We don’t have substantial experience with a large range of violins, or a lot of experience hearing them back to back in different spaces. Experienced violin shoppers will also relate to the following scenario. You walk into a violin shop, you are lead to a long table full of violins in your price range, and you work your way through them until one in particular strikes you as the most exciting violin you’ve ever seen. You say “oooooohhh” and place it aside. Once finished with the row of instruments, you return to the distinguished one and find five more reasons to be excited about it. You are sure you’ve found Mr. /Ms. Right. Upon returning home with your trial instrument, you haul it out of the case and start playing again in your familiar space. Instantly you stumble across nuances in the sound you hadn’t noticed in the “ringy” showroom. The open A sounds like a foghorn, or the middle register sounds thinner than you’d thought, or the upper register suddenly doesn’t seem like it would project enough, or the F naturals in every register sound fuzzy. Or, you run off to your string quartet rehearsal, and as you play you hear your tone alongside the other string players and feel like it is hard to blend, or like your exciting new violin is suddenly edgy, unclear, or lacking a singing quality or warmth. Mysteriously, all of the qualities you had liked about the violin initially are not pertinent in the present moment. You feel confused as you’ve gone from thinking this violin was “the one” and now you can’t stand it for another moment. You glance at your schedule to see when you’ll be able to take the darn thing back. When we play a violin, our body becomes part of the instrument, and we might also sound differently on a violin than somebody else would. Every person who plays a violin turns it into a unique example of that violin, and brings to it an element of personality as well as physique. As I mentioned in my 2015 blog entry, I have heard violins I disliked sound wonderful in the hands of violinists who felt differently about them. The violins in those instances sounded much different from how I perceived them while playing them myself. The more violins I see, the more confused I feel and the less I think I know. So Then, Does Age Make a Difference? I never played a 300 year old violin when it was fresh off the bench or even 20 years old. If I could testify to such, I’m sure I wouldn’t be looking so good at this point. However, I have been teaching violin for 25+ years and have experienced well over a hundred instances of violin acquisitions by students. I hear these violins week after week for sometimes several years. What I can say beyond a shadow of a doubt, and be annoyed with me if you like, is that violins, old or new, do change and usually improve when they are played. Regardless of age, I find a very similar set of behavioral nuances in all violins that have not been recently played. Among them are slower general response, resistance or less clarity and refinement when playing softly, a thinness (not lack of power) in the timbre of the sound, and a slightly brash edge to the tone. After even a couple of hours of playing and even more so after weeks and months, the tone becomes smoother, new overtones emerge, the general sound becomes more mature in a manner that is difficult to describe, and the response becomes easier. Some nuances develop which only the most sensitive ears will perceive, or which a player feels and hears under the ears, and are not necessarily evident in a concert hall. When a violin is played in tune and with resonance, it rings more over time as well. A violin’s individual characteristics are of course evident from the beginning, and neither age or activity can make a poor instrument excellent. By the same token, a completely new instrument can sound exquisite and encompass all qualities we look for in violins, including depth, warmth, power, sweetness, responsiveness, and most any quality we might associate with old violins. I’m uncomfortable calling my sensibilities about tone, or my cumulative perception of characteristics in violins, an opinion. I really don’t know whether age has any bearing on a violin’s sound. I’ve had some experiences with a range of violins I can share. Historical violins I have experienced include several violins by Stradivarius and Guarnieri (oh my!! ), a Pressenda (that was my favorite! ), a couple Roccas, a Storiani, Testori, most members of the Gagliano family, Johannes Tononi, and others. I’ve also enjoyed some examples of Stainer’s influence by Klotz and Thir, which I found remarkably similar in concept to one another and ohhh so different from the aforementioned Cremonese masters. All of these are examples of old violins. I’ve been astounded by many great contemporary violins by globally known makers, and have owned two excellent violins by Joseph Curtin. I have been stunned by English copies of Strads and Guarnieris, such as violins by John Lott, the Voller Brothers, Georges Chanot, and Paulus Pilat. Now that I have challenged the notion that age could mean anything at all, I admit that I will always romanticize the great old Cremonese violins. Some would say I am brainwashed to think that the mesmerizing magic coming from a Stradivarius violin, which rocks the door to my heart, is anything more than a figment of my imagination. Perhaps the aura created around these old gems gives them the placebo effect after all. If I am brainwashed, then by definition of the word I wouldn’t realize it. Therefore, I might be, but I know I’m not alone. But to argue my side, I have seen violins by Stradivarius and other great makers which I did not think were equal to others, which suggests that I am able to think and hear beyond my presuppositions of an instrument. If there is one most important point to this blog, it is that the world and history of violin making is so much bigger than most of our experiences than we sometimes give credit. It is important to respect one another in this conversation, to value contrasting experiences, and to credit others for what they hear, feel, and perceive. There is room for science in the discussion, and there is a need for the perspectives of soloists, chamber musicians, teachers, and amateurs. No perspectives are mutually exclusive, and in my opinion, no opinions based on one’s experience are wrong. April 18, 2018 at 04:30 PM · Speaking of instruments “improving” with playing, one thing I have noticed that I never see mentioned in such discussions is the effect of playing on how quickly the instrument “warms up” in a playing session. If I don’t play an instrument for some months (for example, a viola during a period I’m playing nothing but violin), when I start to play it, I encounter exactly the tendencies described by the author. With a few hours of continuous playing, it will open up a bit, become more responsive, etc. but as soon as it is put away overnight, it’s back to square one, or very close. The next sessions will have much the same result, but as time goes on, with frequent playing, the time between taking the violin out of the case and it responding easily becomes much shorter, and the “deterioration” as it sits unplayed becomes smaller. Probably the overall quality is slowly improving as well, but that is harder to judge reliably, I think. Easy to judge that the violin no longer sounds like there is a sock stuffed inside, harder to compare the more subtle details from day to day. I’ve found this to be true for instruments from 50 to 350 years old, and a wide range of values. April 18, 2018 at 04:47 PM · I agree with most if not all of that. I do think there are great instruments from every era, including the 20th and 21st centuries. Of course there are some poor examples as well. What I have noticed recently is that when a fine player tries out many new instruments they almost all sound the same! Proof that is more often the player, than the instrument. a couple of things at work that contribute to that perception, I think. Playing different instruments well is a skill not universally held. As a dealer friend put it, many people only know one way to play a violin, the way that they play their own (*). If such a player tries out a series of instruments that are similar to their own in the approach needed, the differences may not be striking. An instrument that stands out in a good way may not be any better than the rest, simply more compatible with such a player’s approach to tone production. A better instrument may sound just like the rest in the hands of such a player - so in such a case, the player factor overwhelms all else. However, I have seen cases like this where a few minutes of coaching can show the player how to unlock the instrument’s much better qualities and suddenly they don’t all sound the same. One benefit of becoming acquainted with a range of instruments is that it widens your imagination about what colors and sounds you can produce. I find that once you have experienced them on one or more instruments, there is often a path opened to producing very similar effects on other instruments - imagining the sound you want is helpful, and easier when you have experienced it! Fine players with extensive experience adapting to different instruments can often make them sound very similar because they are rapidly adjusting to produce the sound they want. Here the player is again a dominant factor. A conscious effort may need to be made to truly bring out the character of the instrument. The violin comparison recordings by Elmar Oliveira and James Ehnes do a good job of showing the differences even though the personality of the violinist is present. In an extreme case of adaptation, I once had a chamber music party where two cellos (of different models) by the same maker were present. As a prank, when one of the cellists left the room, we switched the two cellos (we were playing a piece involving two cellos, and the owner of the other cello by the same maker was in the group). So skilled was the cellist in question at adapting instinctively to the instrument in his hands that he didn’t notice, and insisted after we had switched them back (after he left the room again) that he’d been playing the same cello the entire time! When the other cellists present tried to do the same, however, differences were very apparent. (*) This occasionally leads to such players naturally gravitating to instruments which are most similar to what they already have, warts and all, or frustration that they aren’t finding a better instrument which is nonetheless just like their own. Having a teacher involved in the process of selecting an instrument who can help you learn to play it well (even if it is different from what is familiar to you) may be worth the expense (you should compensate them for their time, preferably instead of the teacher collecting a commission from the seller). April 19, 2018 at 07:14 PM · That is an interesting topic. I am a beginner. I just started to play about one and a half years ago. After the first six months with a loaned instrument I decided to buy one. I was quite sure that I wanted an old instrument, not overly old, but old. It was partly based on the idea that old instruments sound better and partly on the fact that I just like old things. I went to a luthier recommended by my teacher. Hehe has an interesting approach. He asked for your financial limit and then he hands your four violins in a case to take home for several weeks to try. You choose your two favourites and he replaces the other two violins and off you go again. It took me 12 weeks and 14 violins before I made a decision. It is a new violin. I am the first owner. Within my financial limit is was the second most expensive one, while the most expensive one, a Bergonzi copy from the 1880s, had been my second favourite. But not knowing anything about those instruments I played, just judging by what I hear (and of course to a degree by what I saw) was the best approach and one that was repeated when I had to choose the perfect bow for my favourite violin. And still a year later I am very happy and as I am a beginner I am not a good judge of the sound development but my teacher really likes it. April 21, 2018 at 11:56 PM · For most violinists, the old-vs.-new question is not the core problem; it's the high price of any decent instrument. Building good violins (however they're defined) has always been labor intensive. At best, outcomes have never been certain. Presumably, demand will always exceed supply, and the pressure on price will stay upward. By various means, if they are played at all, the good instruments tend to get placed in the hands of the highest-performing (and higher-earning) players. This may leave students in the position of never finding out what playing their chosen instrument can really be like, and send many fine players on a never-ending quest for a better fiddle. Though we can applaud programs that bestow temporary use of high-end instruments on contest winners, in the end, doesn't this just intensify the need, without really satisfying it? While some Strads and Del Gesus may be unique in their qualities of sound production, violins by others, Storioni, Seraphin, Pressenda, Montagnana, Balestrieri, Vuillaume, Guadagnini, etc., are frequently matched by new instruments. This slightly-second-tier of antiques, and, more especially, some of the best moderns, can and should be given routinely on a longer-term basis, by those who have the means and inclination to help with this chronic problem. This would not, as some seem to fear, dilute the market for the iconic Italians. Such a practice would in fact be a tide lifting all ships, expanding the popularity of the instrument by raising the currency of good ones, and increasing their market, generally. April 22, 2018 at 01:42 AM · Learning the idiosyncrasies of a bow can also take time. Finding a bow that is a good match for your instrument is a process of comparison and evaluation. My bow is as comfortable to me as my own hand but it took months to get to that point.